Welcome to Darlin Gray World Wide! We're a Seattle-based design firm with a knack for building legacy brands through bespoke design, concise content development, inspired creative strategy and lean, smart problem solving. 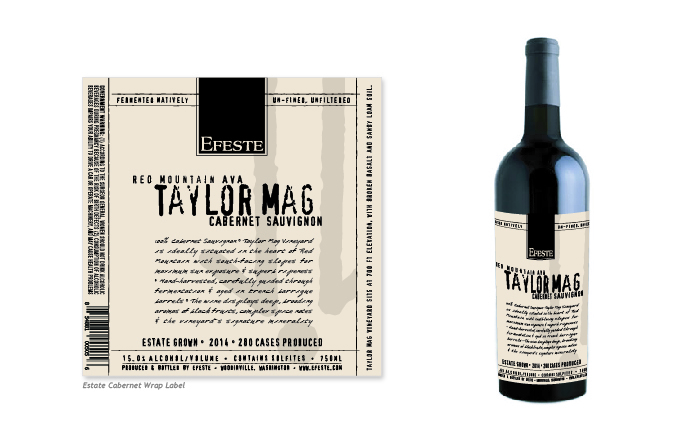 Once we nailed the label revise for the Efeste collection (which you can see here, they came back to us to create something entirely new and different for their Taylor Mag Vineyard Cabernet Sauvignon. The directive? To create something that looked completely different than the existing labels and incorporated a vibe that would appeal to a younger audience. We created this lovely nearly-full bottle wrap with a modern, Italian feel and the result? Ciao, Bella!! !